Recently I was happily surprised at how popular my post on How to Make the Best Buttercream has remained. That video post is all about creating amazing American buttercream, but something quite a few of you have requested is a post on how to make Swiss buttercream. I am happy to oblige! Swiss buttercream is like the classier and more refined older sister to American buttercream. It can be a bit intimidating to make, and may seem like it only belongs in a professional bake shop, but I’m here to show you it is TOTALLY doable. I’ve created a video so you can actually see what each stage is supposed to look like, with tips and tricks along the way in case you mess up. Swiss Meringue Buttercream is actually very forgiving. My favorite part, though, is the fact that it is a perfect blank canvas for ANY flavor additions. I’ve listed off a bunch below to get you started. Let me know if you have any questions in the comments below! There are a few more types of buttercreams than what is listed below, but this is a good list to read to understand and compare the differences! This is basically a combination of beaten butter, powdered sugar, and flavoring(s). 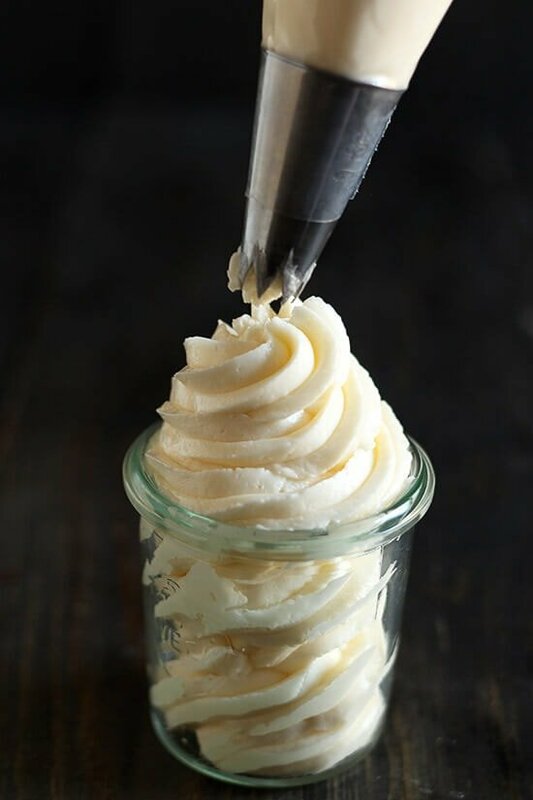 It is by the far the simplest and easiest buttercream, but can often have a very sweet one-note flavor profile. If you’d like to learn how to make The Best American Buttercream, check out this tutorial! This is made by whipping a mixture of egg whites and sugar that has been gently heated in a double boiler until the sugar dissolves and the eggs are cooked. The egg white mixture is then whipped up into a beautiful glossy meringue. Cubes of butter are then gradually added to the meringue, then flavor ingredients. It’s more complicated than American buttercream, but is far better in both taste and texture in my opinion! Similar to Swiss, but is made by cooking a sugar syrup and carefully drizzling it into an egg white mixture. I love Italian buttercream! However, it contains raw eggs, which doesn’t bother me but may be unsafe for some people to consume. Again, requires a similar method to Swiss and Italian but contains egg yolks instead of egg whites. It can be the most difficult to make, as it requires cooking a hot syrup then drizzling it into egg yolks, which can scramble easily. It’s ultra rich and smooth but may result in the consumption of raw eggs. This is just a list of ideas – feel free to go wild and get creative here! Add more or less depending on your preferences, even combine two flavor ideas for something more unique. Be sure to taste as you go along. Add 2 tablespoons pure vanilla bean paste or the scraped seeds from 1 bean. Substitute the white sugar for brown sugar in the recipe. Add 2 tablespoons flavored liqueur such as Chambord, Kahlua, or Bailey’s. Add additional flavors, purees, or mix-ins as desired. Keep in airtight container in refrigerator for up to one week or in the freezer for up to 2 months. Let come to room temperature and rewhip in the mixer with the paddle attachment before using. Frost the cake as smooth as possible. Place in refrigerator until the buttercream has hardened before covering in fondant. Cover with fondant straight from the refrigerator. This makes enough frosting to generously frost a 9-inch two layer cake or about 2 dozen cupcakes. This recipe can easily be doubled. Swiss buttercream is one of my absolute favorites! i love it’s silky texture and slightly mild flavor…btw: I wanted to let you know that I discovered this post in my inbox and when I navigated to your site, I found that it isn’t on your home page, only on your videos page. Not sure if this was your intention. Hi Patty! That’s so strange. What browser are you using? Swiss meringue buttercream has changed my cake baking completely, it’s just the best! The possibilities are endless and it’s SO much better than the way too sweet frostings I used to make (that had heaps of confectioner’s sugar in them). A few weeks ago I made a chocolate cake filled with passion fruit mousse and covered in while chocolate Swiss buttercream… So yummy! Looking forward to trying your recipe the next time! I really want to try this recipe, but need a non-dairy option. Will unsalted margarine or shortening work in place of the butter? Thanks! Hi Miriam! That can work if it’s your only option but obviously won’t have quite the same wonderful buttery flavor or melt-in-your mouth texture. One more question – Where did you get that awesome side scraper paddle attachment?? Thank you for this video! I have been wanting to make Swiss meringue buttercream, but was afraid I might mess it up. I LOVE Swiss Meringue – awesome tutorial Tessa! I use Google chrome, but it’s now showing up on the home page now. Maybe it was just something temporary. Hi Tessa, your Swiss Meringue Buttercream Recipe is amazing!!! Keep it up and looking forward for more wonderful recipes. Thank you. Hi. Will this not melt on a hot weather? It will melt if left in hot weather for too long. Hi Laura! Thanks so much. American buttercream is a bit thicker and sturdier, Swiss is more light, smooth and fluffy. I think that Swiss may be slightly more stable at room temperature but both will get a little melty if left out too long. Whenever I’m serving frosted cakes, cupcakes, etc. I will usually refrigerate them for a while so they keep at room temperature for longer. What kind of chocolate do you use to flavor? If you use chocolate depending on which kind do you have to use more or less sugar? Any baking chocolate you desire. It’s completely up to you and your preferences – feel free to experiment! Hi Tessa! Love this post, cause it shows all the alternatives you have to make better buttercreams, and most of the people didn’t know that. I didn’t know you could do it with Swiss… Just don’t be afraid about Italian or French buttercream, those are the safest cause you’re not eating raw eggs at all, the syrup is at 245F aprox. and the eggs get completely cooked. Instead of Swiss you’re only pasteurizing the eggs and it has to be consumed in the same day. Hope my comment have been helpful!! I enjoy your post very much! Hey so if I use this buttercream on a cake I don’t plan on covering all in fondant do u have to store in fridge and how long can it sit out? Tessa!! Thank you for making such a detailed and beautiful video! I have been trying it out tonight, unfortunately my butter doesn’t seem to mix with the meringue :'( it is so lumpy but soggy…..would you know the reason for it? is it because I mixed the meringue for too long or too strong? I really want to make ones like yours! thank you.. Which type of Buttercream frosting would you suggest for a two tiered wedding cake? Please do have in mind that the venue is an enclosed place with a possibility of being hot. Thank you. hi thankyou for your amazing tutorial ? how long does this sit on room temperature? Great recipe, Tessa. I made your birthday cake and topped it with the swiss meringue. Planning on using your recipes for my son’s Eagle ceremony. I want to make a sheet cake. Would doubling the cake recipe and the meringue work for a sheet cake? So excited to try this and all the variations!! Just what I was looking for! 🙂 I will have to let you know how it turns out. Thanks! Can this be coloured? If so would you use powder or gel colouring? Would this be suitable to pipe ruffles or rosettes? I have used normal buttercream to pipe rosettes on a cake before and they ended up sliding down the cake! Thanks for the video. Can granulated sugar be replaced with Confectioners sugar? Hi I am wondering what if I will not use the paddle attachment as my mixer doesn’t have that. what will happen? Wow! All I can say is wow! Where has this frosting been all my life? I made it exactly as you instructed and I added in raspberry puree and it was fantastic! Amazing job with this recipe! I kept hearing about Swiss Meringue Buttercream on the baking competition shows and did not know what it was. I was web surfing and found your blog/website and it has become my new favorite. I made th SMB this evening as an experiment for some cupcakes for work, I have a new favorite frosting! Creamy, rich and not sickenly sweet. Hi there, I have been wondering whether it’s possible to freeze a cake that’s been filled with swiss meringue buttercream. I have frozen it in a container so know how the consistency changes when it thaws. Have you any experience/thoughts on this? I have searched all over the net and no one talks about this aspect of smb. Hi Dana! I wouldn’t freeze a frosted cake. You could freeze the buttercream and cake layers separately, defrost overnight, rewhip the buttercream, and assemble when ready. That preserves the texture the best. What went wrong? All I got from this is a slack mess. It’s 40F outside here today, and 68F inside, so ambient temp isn’t the problem. It took 45 minutes to get the temp of the egg white mixture down to where the bowl didn’t feel “warm” anymore, so long I didn’t know whether to get beating the meringue or stop for fear of overworking it. (I’m not sure where you got your time estimate for that step; do you make this inside a walk-in?) By then the butter was probably too soft but time was running out and I had to use it regardless. The mix started to slop up immediately as soon as I started adding the butter. It became the consistency of thin cake batter with millions of specks of butter in it. I couldn’t determine if it had broken or what. I tried refrigerating and rebeating it, but all I got from that was well-beaten cold butter specks soup. So I changed course and applied a hot towel to the bowl. After a few minutes of whipping the mess vigorously over heat, it actually began to thicken. Twenty minutes of whipping later — by the way, lose the bit about changing to the paddle attachment cuz when this stuff goes south, and it will, the paddle is as useful as one boot — it became a cohesive mass with a bit of loft but absolutely no strength or ability to hold its shape. Even after refrigeration, it is unable to maintain form and if applied to the sides of a cake will slump right off. Honestly, this isn’t worth going through. Plain buttercream is blehhh but it’s more predictable and easier than this, and will work every time. I definitely don’t make this inside a walk-in, in fact I live in the desert. Did you use a thermometer to gauge the temperature of the egg whites as they cooked? I’m thinking something went wrong at the very start that ruined the recipe. It should certainly not take 45 minutes for eggs whites to cool. Did you watch the video? 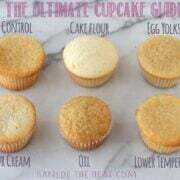 I cover what to do if your buttercream breaks. I hope you’ll give it another go because I’ve made this recipe a dozen times and many others have too with success. Tessa, as I said, I couldn’t determine if it had broken or not. It was liquid with tons of tiny butter flecks in it — tiny! — and didn’t have the clumpy curdled look of broken mayonnaise or hollandaise. So I tried chilling it, and when that went nowhere I resorted to heat. It finally whipped up silky and was delicious, but it had absolutely no body so ideas of piping it went out the window. You video doesn’t come close to depicting the soup I was dealing with. I warmed the eggs and sugar over hot water to 140F as measured with my most reliable digital thermometer, and whipped it on the stand mixer for absolutely ever waiting for it to cool down to “no longer feels warm” (a highly subjective determination that might be part of the problem). I’m in the desert too (Utah) but that’s not an issue this time of year. Thanks for responding. I’ll try it again because I’m a diehard, but my goodness but this one was a bear! Hmmm. I’m still a bit surprised! It’s so hard to help without having been there to see it all. Perhaps this time stop whipping at the 10 minute mark since the warmth may indeed be too subjective. Let me know how it goes!! This was my fist attempt at Swiss meringue buttercream and I must say WOW!! It turned out perfectly. The little bit of extra time it takes is well worth it. The texture is amazingly smooth with out the gritty texture my standard buttercream sometimes gets. I winged it when cooking the sugar and egg whites as I didn’t have a candy thermometer but I made sure the whites where hot and the sugar was melted. I can’t believe I haven’t attempted this frosting until now! Will be a new favourite. Thanks for the great blog post and video. I don’t have a counter top mixer. I have a hand mixer -would I just use it the same as you did with yours? Wondering if it will work ? Amy suggestions. My hand mixer didn’t have paddle blades. ??? Any tips will help!! Thanks. To be honest, this recipe would be quite a bit more difficult without a stand mixer. I’ve never attempted it, though I’m sure it would work out in the end. Do you just have the whisk attachments? I followed your Swiss Meringue Buttercream recipe and it turned out great. Thank you. Have you made a version with cream cheese? If so, what were your measurements? No, I haven’t tried that out yet so I’m not much help. Let me know if you give it a go! I followed the tutorial on the Swiss Meringue Buttercream;everything was perfect until the 4th cube of butter was added…then all went south.The whole batch looked like wet cottage cheese.I tried to cool it in the fridge and continue to beat again but the batch never recovered.What went wrong??? Hello everyone. So I tried this recipe over the weekend for some cupcakes. AMAZING AMAZING recipe. I have tried a recipe long time back for SMBC and it was ok but this one is simply gorgeous. I had no issue what so ever, the process was smooth and the end result is silky, out of this world frosting. I live in a very hot country bu the kitchen temp was nearly 21-22C. I left one cupcake (iced) at room temperature till next day and it holds the shape pretty much well. I used half of a vanilla pod for flavor. One question though: can i try this with only 1 cup of sugar? SO happy to hear you enjoyed the recipe! I’m really not sure if it would work with less sugar since the meringue is really the base of the buttercream’s structure. If you do try it with less, let us know how it turns out! Hi Tessa! I have a question, my friend want me to make a smash cake for her daughter’s 1st birthday. I am not a big fan of American buttercream because I think it is very sweet for me however some people do like it. Can I use swiss buttercream for smash cake? Is it ok for toddlers to eat it? I would be appreciate to hear from you! Thank you! Hi Amanda! I’ve never made a smash cake so I can’t speak to that, but it should be perfectly safe for toddlers to eat since the egg whites are cooked to 140°F. If you’re worried, I’d use a thermometer just to be safe. Have fun at the birthday! Your best bet is to use shortening instead of butter, it will hold up to the high temperature without melting as easily. This looks fantastic! Just a quick question. I’m going be making an 8 inch rainbow cake with six layers, and decided on Swiss meringue buttercream for its stability. Will one batch be enough to fill and frost all layers and cover the whole cake? Can you make Swiss maringue with caster sugar to make a little more smooth???? Wow wow and wow!!!!!!!!!! 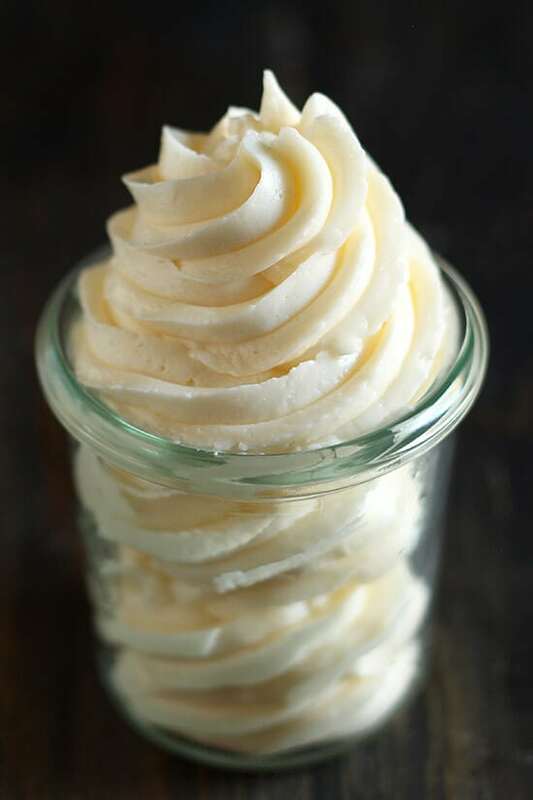 !Just made this fantastic butter cream, and it turned out so light, fluffy and full of shine. Love it, will use all the time. Fantastic, Janet! Thanks for your comment. Sure! You can make a few big batches and freeze it so you can have things ready ahead of time, too. That comes in handy during the chaos of a wedding 🙂 I’ve done that for a wedding cake with this recipe. Let come to room temperature and rewhip in the mixer with the paddle attachment before using. I was just wanting to know how long the buttercream can be left at room temperature? All those years of using canned frosting for school birthday cupcakes, what a waste! I now find myself looking for reasons to bake so I can pipe this beautiful Swiss buttercream on my cupcakes. I’m so very glad I found your video. Thank you. Wow, that makes me so happy! Thanks Terry! Hi Tessa ! I just made a half batch of the SMB to try out with Russian piping tips. Have been experimenting with frostings for these tips the past few days as I find buttercream too sweet. This worked like a dream !!! I had to rewhip the frosting as it didn’t hold up the first time. To respond to another comment – I used an electric hand mixer for whipping with no trouble at all. Since these don’t have a paddle attachment I used a whisk to combine the butter. Can a cake with this icing sit out like a regular buttercream cake? I live in Australia & it gets hot, my regular buttercream recipe I use half butter & half copha, could I do the same with this recipe? I’m all out off vanilla extract would and normally I would use maple syrup as a substitute. Would this work here? Oh I have a fail. Mine is too soft no body to it. I’ve tried refrigerating and remixing. Should I mix on high speed? Or maybe too much butter. Please help. This is my first failed Swiss meringue and my first time using this recipe. Hi, Tessa! I made this frosting this morning ahead of time to frost my daughters cake with. As I was putting it in the container, I noticed gelatin like pieces throughout. What would have caused this? After I take it out of the fridge and bring to room temp, will I be able to get rid of them by mixing the frosting up again in my mixer or is it totally ruined? Otherwise looks and tastes amazing!! Thank you! I made your Swiss buttercream for a rose cake for my granddaughter’s third birthday! It is amazing, and pipes like a dream! Thank you! I had first tried a different recipe, and it was good, but not nearly as good as this recipe! After filling the cake and starting to pipe the roses on, I didn’t have enough icing left to finish the cake. I used your recipe, and scraped off thirst try and blended them together so the color and flavor would be consistent throughout the cake. Both were great, but yours and your instructions were the best! This is my first time making Swiss meringue buttercream and I will never go back to American buttercream. I followed your recipe and it came out delicious. I’m so glad I came across your video, thank you for sharing. I have a questation why my buttercream is so loose? Hi Tessa! I made this last month for some Maple Whiskey Candied Bacon Cupcakes! It turned out so good, I will never make a regular old American Buttercream again! Everyone kept asking, who made the cupcakes?!? I’m making cupcakes for the 4th of July this weekend and I’m wondering if this is possible to double? Do you think it would be too much for a standard Kitchen Aid mixer to handle? Or would proportions be off? You’re the best! Thanks! Love love love this recipe. Wish I would have known about it sooner. Will never make the icky powdered sugar and shortening recipe again. So smooth and silky. It is easy to make too! Hello! This is a great recipe and wasn’t hard to follow at all. Thanks for that! My question is about the completed amount. It says 5 cups, but I think I barely got less than 4. Did I not whip it enough? I still need to add the coloring, so plan to whip it up again after some refrigeration. Can this recipe be cut in half? If I only need it for 12 cupcakes. Have you ever tried the buttercream recipe where you cook flour and milk first before adding the sugar and butter? It is delicious but I don’t know what kind/style of buttercream it is. My swiss frosting is not getting stiff .what to.do? Hi, i tried the recipe, despite the fact i almost cooked the eggs in the beginning everything seemed to go well. However at the end i wanted to add some blueberries to reach a “blueberry flavor” and i guess this was the main mistake. In a while i had just disgusting liquid mess. Could you advise how can i flavor this cream and avoid this mess? Do you think that the cream would be OK (without blueberries) even though i cooked it a bit too much at the beginning or would it influence some attributes of this cream? Your best bet would be blueberry jam or preserves (which I know can be more difficult to find than other berries). Swiss Meringue Buttercream is a little more difficult to customize because you can’t easily offset extra liquid with more confectioner’s sugar like you can with American buttercream. Besides the flavor customization options I’ve listed in this post, jams/preserves or even gourmet extracts work best. Hope that helps! Hi Tessa. I had a question about this buttercream. I made Italian meringue buttercream before and stored it in the fridge. When I took it out of the fridge the next day I brought it to room temperature or at least I thought it was at room temp and when I re-whipped it the buttercream curdled. Will with happen with Swiss Meringue buttercream and if so how can I avoid this? Thanks for this tutorial! Just made swims meringue buttercream for the first time – following our recipe and am delighted!!! It’s wonderful! Still have to make the cake and pipe it on but at this point I couldn’t be happier! Thank you Tessa. PS I used a hand held whisk – and only had the egg beater attachments – and no issues at all. First time making this icing and it was amazing. Though yours seemed a bit more thicker mine was still a bit soft. I put it in the fridge and it did harden up nut once back to room temperature it was thinner. It still stayed on the cupcakes so it wasn’t that thin but it wasn’t like set icing. Have I done something wrong, it just didn’t look quite as stiff as your finished product. Hmm it could have been a simple ingredient mis-measurement (were you using large eggs for the whites?) or possibly your climate. Was it warm or humid when you made the buttercream? It’s cool here in Australia at the moment. I missed using the salt so maybe that could have affected it? They were large eggs as well. Hello , tried youy swiss buttercream and it taste good. Just wondering what if i will do white chocolate wissbuttercream frosting.. Thank you. Can I make the Swiss meringue buttercream with salted butter cause I can’t find unsalted butter!!!! Hi, I was just wondering which caramel do you add to get the caramel flavour? This was my first attempt at making a swiss buttercream, and wow it is silky smooth and delicious! I made it with salted butter, because I didn’t have unsalted. It still tastes delicious, but I think for a cake I’m making later this month I’ll definitely go with the unsalted. I was intimidated by making meringue, as I don’t have a double-boiler, but I rigged one up with a saucepan and my kitchenaid mixing bowl and it turned out perfectly. So smooth, light, and delicious. I added vanilla bean paste to it, and I can’t rave enough about it. Thank you for posting such an easy-to-follow recipe! I just found your recipe, It looks absolutely perfect.!!! I have a question, do I have to use granulated sugar, or I can use Berry sugar instead? or it will can I used either?? I watched your video and it look exactly as it should be, You are fantastic!! I am starting to cut the butter, and I have a question, how small I should cat the butter,? and how often do you feed the buttercream with the butte? after a 1 minute? I am making this recipe for my future daughter in law, I am in charge of the Wedding cake!!!! Hi there! I’m not sure what Berry sugar is. Granulated is best for this recipe. The butter should just be cut into cubes about 1/2-inch big. Add the butter after the last pieces have been incorporated. Good luck!! I just finished your recipe for the Perfect Meringue Buttercream and it is WONDERFUL!!!! it is so silky so delicate, and absolutely DELICIOUS!!!! Hi there! This is my go-to recipe for SMBC as it always tastes delicious! I just have a very quick question, how long can a SMBC covered cake be stored in the fridge for? I’m a hobby baker and a friend needs a cake for Sunday but I only have Wednesday free to bake, ice and decorate. Will the cake remain moist if it’s in the refrigerator for 3-ish days? Hmmm to be honest I’ve never frosted and stored a cake for that long before. I think it could work, as long as you use a thick coating of buttercream to “seal” in the cake. When do i incorporate the food coloring? I need to make a colored cream for my cupcakes. Thanks! That’s the nature of Swiss Meringue Buttercream! You can try to reduce the butter, but it might not come together properly. Great recipe! Just wondering how it goes if you make it in a double batch? Does it affect the ebd result at all? And if a double batch would fit in a 5L mixing bowl? Doubling shouldn’t affect anything else! It should fit in that sized bowl, but I’m not 100% sure. Thanks so much, and one last question… would using an egg replacer be ok in instance of egg free request? Oooh that’s a tough one. Eggs are essential to this recipe so I’m thinking an egg-free version would require a lot of experimenting and testing, if it’s possible. Tessa, is this stable buttercream?? because the temperature reaches 34-38°C in my place. What would you suggest that could stand long in hot temp? The american style too sweet. Hi Claire, since butter starts to melt at 32-35°C, no buttercream is going to be stable at those temperatures unfortunately. That’s also what gives butter its melt-in-your mouth appeal! The only way around that would be to use shortening, which has a melting temperature of about 48°C. I made the Swiss buttercream once and decided it should be its own food group! Delicious! Then I made it again and added lemon juice. It was a disaster. It curdled and I was never able to get the clumps out. Now I want to try chocolate but am skittish after the last mess. Can you be more specific on what chocolate to melt and add? Thanks. Can I use a stick more of butter? People are experiencing deflated meringues because they should not be switching to a paddle attachment. Swiss meringue buttercream can easily be made without viewing it as too technical. Heat sugar and egg whites over a simmering water pot (the water should never physically touch the bottom of your egg mixture bowl), while constantly stirring (don’t walk away at this point), and in about 5 minutes you’ll get a very hot (not boiling) to the touch mixture, with a slightly eggy smell and completely melted sugar. immediately place in stand mixer with whisk attachment and whip at medium speed until a shaving cream consistency (medium peak) has been reached. At this point the bottom of the bowl will/should be barely warm to the touch (takes 10-15 mins), that means it’s safe to add the butter. It’s imperative that the butter consistency is just slightly softer than room temp (but NOT melted/runny), if you can’t easily smush your finger into it, let it soften more; it has to be super pliable. Turn the whisk speed up to medium high and add a small chunk of butter every few spins. 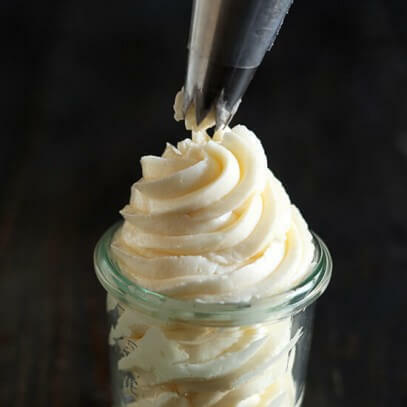 When butter is out, add flavoring and salt with another 20 second spin and you should have a smooth, fluffy buttercream. If it’s still lumpy, keep on whipping. I tried my hand at this over the weekend. The first time, my egg whites started to cook and I started getting scrambled egg whites. lol. Lesson learned. The next go around, I made sure the temp was lower and it worked great. By the time I added my butter, it was pretty runny (butter was too warm). I let it sit in the fridge and whipped it again, adding my vanilla extract and salt. It turned into cottage cheese which made me laugh. You get that moment of ‘this isn’t working, maybe I should throw it out’. My family loved it. My husband wants a giant batch of it all his own. Hi Tessa, im reading all the comments from top to the end. Im so interested making this SBM. Just few questions, can i use this for fondant cakes? Does it need to be fridge? I use ganache and i dont refrigerate my fondant cakes. And can i use this for filling as well? Would it stay soft and creamy? Thank u. Sorry have so many questions. Im dying to discover a great SMB. At what point do you add in the flavorings such as preserves, or chocolate, etc? Does the instant coffee and cocoa need to be dissolved first for the mocha flavoring? Thanks! This looks delicious. I love your ABC recipe too. Italian meringue has raw eggs ? what ? I’m about to give the SMBC a second try. First try turned out great, I put it in the fridge overnight, rewhipped, and after about 20 minutes in a 75 degree kitchen it looked like it shrunk in half. I need to fill a cake tomorrow and want to make the BC tonight. Do you think the same thing could happen again? How much espresso powder do you dissolve in the 2 tbsp water? Hi Tessa, I just discovered your videos and website a few days ago and have successfully recreated a few of your recipes. Your instructions are clear and I’ve gotten great results! Thank you! I’m wondering if for the Swiss meringue buttercream if I can substitute egg whites with egg whites from a carton? Since there’s only a few ingredients in this recipe, I’d suggest using the freshest possible! Egg whites from a carton may not produce the best results. I used this recipe as my first attempt at Swiss meringue. Worked a treat!! Beautifully glossy and smooth. I flavoured mine with peppermint essence. I read some other comment about the eggs not whipping – did you use packaged egg whites? can you use meringue powder instead of the egg whites? I did a fair bit of research and youtubing until I settled for your SMBC recipe – this was my first attempt and it worked perfectly, I think. But I have a (probably dumb) question – is the egg and sugar mixture meant to smell a bit eggy after it’s been heated? The temp never really went above 140 even though I wanted it to get to 150 to make sure eggs were safe, but then I thought maybe I “cooked” my eggs if it smelled a bit eggy? But the meringue whipped up fine within four minutes, the whole thing had the right texture and taste, just a bit curious about the smell. I feel like it still lingered.. Not enough vanilla or cooked eggs, you think? Yep, a slight egg aroma is completely normal! Hi, Tessa. Inwanted to make mocha flavored SMBC. So would I need to dissolve the cocoa powder and instant coffee before I add it to the frosting. Would this swiss meringue buttercream work for a wedding cake?? Any suggestions on a frosting that I can use that is not so sweet as standard buttercream?! I am making my friends wedding cake -14″ -10″ & 6″ tiers! Any tips would be welcomed!! I just made mine but it is appearing as if it has some liquid.how do i rectify this? I tried this recipie and it was awesome…. creamy and satin feel in mouth… i never liked American buttercream..way too sweet and buttery..this recipie was just perfect! Your tips also helped when it turned little soupy. Yay! Thrilled to hear that, Betsy. I haven’t tried to reduce the sugar since it’s so crucial to the structure of this recipe, so unfortunately I can’t offer any tips there. Yes!!! Thank you so much, I just made this and used it to fill and frost a cake. Absolutely perfect! I’ve tried several recipes for swiss meringue in the past and none have been this good and as easy to follow. You’ve got a new fan in me! Yes, this recipe was carefully constructed and reducing the butter would likely result in a flop. Thank you making it now ! Mom bday TM . So excited to try this buttercream!! Wish me luck! HAND MIXER And HOT WEATHER: This works with a hand mixer!! I grew up with a kitchen aid, but until a few weeks ago, I only had a hand mixer. This recipe worked just fine, you just need a strong arm for the lengthy mixing. Also, I have no air conditioning and I’ve made this recipe in hot weather in July. This has become my favorite “classy” frosting. I am making this NOW and wanted to k now how long it usually takes to incorporate the butter chunks into the meringue after the bowl has cooled. So far I have been adding a chunk every minute or so and 3 sticks of butter gave me about 36 chunks … I have about 10 left. That means I having incorporating the butter now for almost a half hour … is that right? Seeing as the recipe says the time to make this is 20 minutes, I am confused because it took almost 15 minutes to get the sugar/egg white mixture up to 140 degrees. The frosting isn’t super smooth and has itty bitty ‘grains’ of butter in it. What am I doing wrong, or not doing ? Follow-up …. The frosting still didn’t come nice and smooth after mixing it for a long long long time so I googled to see what I could do. I found a forum where someone had suggested that if the frosting was like ‘cottage cheese’, it was too cold. This appeared to be my situations. the suggestion was to warm a small amount of the frosting in the microwave til it looked like melted ice cream (this took about 10 seconds on 50%) then slowly add it to the bowl. Success!!! I now have smooth frosting that not only tastes amazing but looks nice and smooth. thanks. I will keep this recipe . Ive just made 3 batches of Swiss Meringue buttercream today , 2 batches ive coloured them in 2 shades of pink that was fine happy with those but my 2 shades of blue are not coming out as blue its more greenish especially the light blue that I want the most but the darker one is ok. Is their a trick in making the buttercream white cause after you add the amount of butter it turns yellowish. Apart from that I love it . Hi! I adore this recipe. I am planning on making it for cupcakes today but I just tasted one of the cupcakes and they are not sweet enough. If I add a bit more sugar to this buttercream during the double boiler stage will it affect he consistency/ ruin the meringue? I was thinking of adding a 1/2 cup. Thank you! I wouldn’t touch the amount of sugar in this recipe. I haven’t tried that but I don’t think it’s worth the risk! Maybe you can fill the cupcakes with something sweet, like marshmallow creme, Nutella, or caramel? Hi Tessa – I made this 3 times and the first 2 times I couldn’t get it really smooth. The third time, I took my time and when the butter was all in it was still not really creamy – a little broken looking – bits of butter. Then I upped the speed to 4 or so on my Kitchenaid and it got completely smooth and creamy! Amazing! 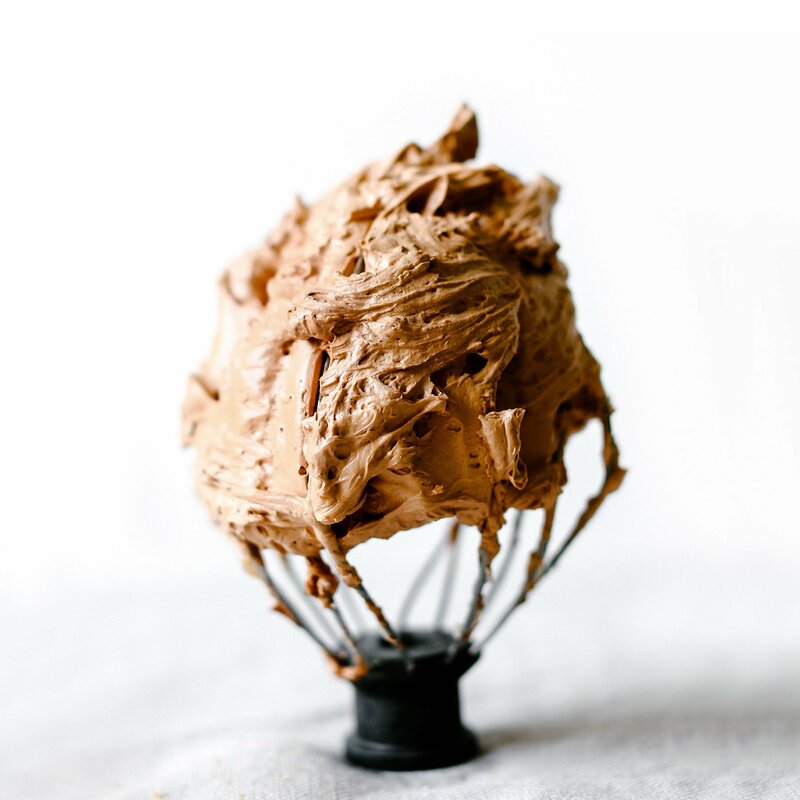 I made coffee swiss meringue buttercream and I added the instant coffee to the egg whites in the beginning – 2 tsp per batch – I made a double batch! Finally, a few years ago I made a wedding cake for a good friend and the book I had recommended Italian buttercream. This is so much easier! Thank you!! I put this on your double chocolate cake which is also amazing! I have my mum’s old school mixer which doesn’t have a paddle attachment. Will it still work? What would I have to do to add the butter using the regular attachments? So glad I found this recipe! It’s my new favorite frosting by far. Made it today and it is AMAZING. Thanks so much for the post. I follow your website and love your recipes, tips and tricks. You’re a very talented young lady and very good at what you do. Keep up the good work! One quick question..do you need at add or subtract anything to the recipe in order to make the additional flavors or purees work? I’m worried about ruining the frosting. Thanks. Thank you so much!! I really appreciate that 🙂 You shouldn’t have to make any additional changes for the flavorings. Hi! I was wondering, could you substitute the sugar for a replacement like Stevia in the raw? Thanks ,for this recipe it’s a big hit in my house .Previously I used to make American buttercream but everyone felt it was too sweet,after trying your recipe everyone liked it .Now any cake we bake at home we use this recipient. Will this hold up well for making buttercream flowers? 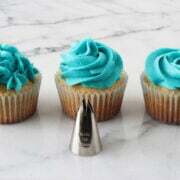 And will it work with the Russian piping tips for making tall tulips and such? This buttercream is very silky and soft. If you’re making intricate flowers I’d reccomend American buttercream so you can adjust the stiffness easily. WOW! GREAT! A lot of helpful information …THANKS! My daughter and I tried twice to make the Swiss Meringue butter cream. The meringue was so thick and fluffy but the instant we added a cube of better it “turned to soup” according to my daughter. We were careful to make sure the bowl no longer had any warmth to it. We used room temperature butter (about 70 degrees). It went totally flat and no longer fluffy. We tried continuing to beat it, refrigerated it, nothing seemed to work. Any ideas? Hi. Can you tell me if there is a particular type of chocolate to add for the swiss buttercream? Recipe calls for 2/3 cup cooled melted chocolate. I have Merckens milk chocolate disks. Would this work? Hi, on the swiss meringue I can add any flavour I want like Mint, mocha? Hey! Thanks for this awesome recipe- it’s my favorite and new go-to! I’m making lemon blueberry cupcakes for an outdoor party in June, but I’m afraid the lemon cream cheese frosting won’t hold up in the heat, especially since it was difficult to pipe in 50 degree weather. I was wondering if cream cheese could be added to the meringue, instead of or in addition to the butter, to make it like a cream cheese swiss meringue frosting. Thank you! I LOVE your blog and this video was fantastic! I’m a visual learner and it makes things so much easier and clearer. Also, all the ways to change the flavor of the icing was wonderful as well. You are such a lovely young woman as well as a very talented baker and writer! I live in FL and room temp is 75 degrees, is that too warm for room temp butter? Also, after I make frosting for cupcakes, I can refrigerate but they will be sitting out, through out party, will the frosting melt at 75degress? Just made a batch for the first time. This is awesome! Thank you for sharing a great recipe & a good tutorial! Would the use of powdered egg whites work ok in this recipe? I have been looking for a stable frosting, is this frosting good with humid weather? Hey Tessa, me going to make this for my daughter’s 11 the birthday cake next week. I was wondering if I can use salted butter instead? Thanks it look goot! I wanna give a try of your SMBC recipe, but might need to mix it with shortening as I need to let the cake out at diff room temperature and scared that without shortening it’ll melt easily. Any suggestions for the one mix with shortening? And lastly, can I do the double boiler using another bowl and transfer it to the stand mixer after instead of using my stand mixer bowl directly? Thank you for sharing your recipe. I used it for a naked cake, it looked spectacular and tasted delicious. Hello Tessa, first of all, thank you for taking me up in your comunity. In Germany you have a very very good type of buttercream, made with custard. I find it lighter than pure buttercream. You prepare a custard (normally in Germany you use a powder, but you can prepare it all homemade), but with more sugar, when that is cold enough, you mix it and add, always mixing, butter at room temperature. Hi. I only have a standard mixer. Can I still make this work? I’m tired of sickeningly sweet buttercream. One more question. How does it do under fondant? can you use the pasteurized egg whites that come in a carton for this swiss meringue buttercream? I generally find the best texture comes from fresh egg whites! I’m making monster cupcakes and smash cake, which of the buttercream would you recommend the Italian or the Swiss? I need it to be stiff enough that monster ” fur” stays stiff. I tried making swiss meringue buttercream using only hand mixer but it is very soft as in runny. My hand mixer don’t have paddle attachment, i only used the whisk. What could be the problem?? I followed every single step in the video.Thank you. Thank you for your tutorial. You broke it down well. One question: I want to make this passionfruit flavored. Can I use passionfruit fruit juice? And how much? I have no clue what’s the best way to flavor it. Thank you in advance. hi mine went a bit lumpy and could still see butter bits what do I do? I have two questions. I am baking cupcakes for a wedding in the middle of September in Eastern PA. My first question is how does your Swiss Meringue Buttercream hold up in the heat if it’s still 80 degrees and humid in Sept? The second question can I use the flavor ideas you have posted under how to make perfect buttercream for the swiss meringue buttercream recipe? Thanks so much and I hope to hear from you soon! Sorry, I thought of a third question. If the swiss meringue won’t stay nice in hot and humid weather, can you do half butter/half shortening to make it more stable? Thanks again!! Hello, I need to make a cake 2 days before the event and drive 6 hours with it. How do you suggest I store the cake before transporting it? It will have swiss meringue buttercream flowers decorations. Will it hold up? This will only work if you use fresh eggs and not egg whites from a box. Egg whites from a box will not whip stiff enough. If you are using them add 1/4 of a teaspoon of cream tartar per egg white, 5 for this recipe. Otherwise you will end up with a ‘soup’. I also had to watch while adding butter and was able to add half the portion before I started to notice the butter turning into ‘soup’. Ive just discovered this recipe. I always make normal buttercream and then regret it as my cakes are always too sweet and sickly. Your icing (Swiss meringue) is absolutely delicious…. i left out the vanilla and salt and used my favourite butter, Lurpak. It’s so silkly, light and buttery and a lovely pale colour. Straightforward to make and good to pipe. My husband is licking the bowl now. Thank you so much. I will always choose to put in the little extra effort to make this in the future. I want to use the swiss meringue buttercream for a cake decorating competition that i have to decorate at the venue. Can it withstand temp of 30- 32 C ? Or what other alternative can i use ? Hi i was wondering if i could use pasteurized liquid egg whites from carton? If yes, do i do the same steps(heating egg whites with sugar)? Hi great video! Thank you ! I was wondering if i could use pasteurized egg whites from a carton? If yes, do i need to heat it up or can I use it at room temperature? I made this buttercream to decorate the top of a chocolate cake and it was absolutely delicious! it took a bit long to make because I don’t own a stand mixer, but it turned out well:) the only problem I had was the consistency, which wasn’t as thick as I expected, but apart from that this recipe was a success! I wonder if Tessa can explain why the consistency was rather thin:) have a nice day!! Can I use an any own mixing bowl to place over the shimmering water not to touch it when whisking?? Because I didn’t own a mixer bowl specified at my home ! I love this recipe, its like eating a cloud! So light and fluffy sweet but not too sweet. Am I doing anything wrong to cause this? Whelp, I just made this recipe with the addition of almond flavoring, and…..it turned out great! I was afraid my butter was too soft, but it went through every stage you showed in the video. Gotta be honest, I can’t decide which was scarier, the thin, runny stage or the curdled stage. Thanks so much for the recipe and the video showing all of it. Can’t wait to ice my mom’s birthday cake. She’ll be 89 tomorrow, July 4th, and still living by herself and playing golf even after breaking her pelvis in 3 places this time last year! Hi and thanks for all your work perfecting and posting your recipes! I’m really excited to try this buttercream with your chocolate cupcakes for the first time this week. However, my stand mixer has a metal bowl. Do you recommend using the metal bowl over the double boiler or should I use a different glass bowl and transfer? Either way, does this affect the timing of the other instructions, like how long to whisk the egg whites? I saw a couple others ask similar questions, but no answers posted from you yet. Hope you can help! Thanks! I tried this recipe this weekend and what a disaster. I followed the direction exactly. Some of my sugar granular never dissolved. I used a digital thermometer and measured to 160F, and some of the sugar crystalized on the side of the mixing bowl. After whipping the egg white and sugar for about 30 minutes, it turned out looking like whipped butter. I just can’t imagine anyone frosting a cake with whipped butter. It showed very little evidence of egg white in the mixture. I was very excited to try this recipe, but what a disappointment. I have always been in love with the icing at my favourite local bakery… but never knew what kind of black magic they used to create their cravable icing. For my own cakes I usually use a whipping cream base frosting, but I was baking today with my kids and started searching the web for a not to sweet icing… I thought I’d give this a try, low and behold THIS is the icing the bakery uses!!! Roughly what’s size cake will this recipe cover? Holy cow! This turned out awesome. Better than other recipes / blogs I’ve followed before. I love that you included flavoring options. I used 1/4 teaspoon espresso powder for every cup of buttercream and it’s perfect. This looks amazing. But i do have a question… im trying to find a recipe for a buttercream that isnt made with powered sugar, but that also doesnt have to be kept cool. My italian buttercream melts every time… help! The comments on this made me laugh, seriously stick to the recipe, and follow EVERY instruction, from making sure there is no grease to weighing every ingredient and you will have the perfect buttercream! I have used this recipe over 100 times and it never failed me… I double and triple the portions (kitchen aid stand mixer) and before I add the butter I measure out 3 equal bowls of the cooked and whipped egg whites, then whisk them up individually with the butter and add different flavours, it saves so much time! I just stumble upon your buttercream guide, and i must confess that watching your video has immensely improved my skills on buttercream. Indeed, I am grateful for sharing these videos that have helped a beginner like me. However, my question is thus: What alternative can you recommend for someone that doesn’t have electric mixer?. Hi! I tried this recipe and is super delicious! But since I live in Puerto Rico, the heat keeps melting it too fast! It wont allow me to pipe not even cupcakes, it acts like whipped cream. Do you have any suggestions?? Hi Tessa, thanks so much for sharing! I’m hoping to make a three tier or two tier wedding cake..plan to use Swiss meringue buttercream. Would it be essential to use the same bowl that I’m heating up egg whites and sugar to whip it up? My electric mixer uses a plastic bowl so thinking of transferring heated egg whites mixture to it to whisk. Meringue came out perfect – not used a double boiler before – however ended up throwing it all away. Once the butter was added it curdled, or so I thought, so I beat it like a woman possessed. No change at all. It was the consistency of runny jelly so I cooled it, but nothing! Waste of time and good ingredients. Obviously I did something wrong but I can’t figure out what? Happy New Year Tessa. Made my first Swiss meringue with my first kitchen aid mixer I got for Christmas. Turned out so thick had trouble piping. What happened? Put it n you marble cake posted recently, making cupcakes. New Wilton silicone liners made them too small and turned out dry. Sad. Frosting tasted good but not fluffy? Any suggestions? tessa with swiss merigue buttercream can you make buttercream roses or flowers thank you for your comment. I love your SMBC but am having trouble with my colours changing, pink turns peach, blue turns green etc. I know it’s because of the yellow butter but how do I avoid? I’ve made Swiss Meringue Buttercream frosting 30 or more times, always successfully, until today. Meringue was perfect, glossy very voluminous. I switched to paddle , beat on Med low until bowl was cool, then added room temperature butter(still firm), 1 tablespoon at the time. Before I finished adding 2nd stick, frosting began to curdle. It quickly went downhill from there. I tried refrigeration for about an hour, mixing for 10 minute increments, adding 1/4 teaspoon cream of tartar. Nothing brought it back. I hate to throw it out. Can I use it to make pound cake? It is now refrigerated. temperature. It will not freeze. Too high of a sugar level. When The sugar and egg syrup is cool, I beat BUTTER til light and fluffy. The butter is the item better able to take the additional ingredients and create a stabile emulsion. After, I add half the syrup and beat til incorporated, then add remaining plus vanilla. It is firm at this point! Being newish, I don’t know what adding cookie butter will do to it. My son loves loves cookie butter. Does anyone else make SMBC like me? Have you added semi fluid type ingredients to final SMBC? Any suggestions would be great! Thanks!